Right after these pics were taken and we had had my birthday dinner with friends, I had it tailored slightly just to bring it up on the straps so that my bra wouldn’t show under my arms (see it peeking out?! GAH!). If you know me, you know that showing your undergarments is just a big no no (and it’s not just my age, its a no-no for anyone! ), so off I went to Nordstrom where Kent bought it for me (here is the link if you want to check it out for yourself…ON THIS LINK, and I have GREAT news!! It’s on SALE!!! Save 40% peeps!!) For about $10 whole dollars they fixed it up to fit me perfectly. Another example of how tailoring in a small way, can make you more confident in the outfit you are wearing, and you look forward to wearing it. But here’s how I decided to style it today, for running errands around town with my kids. Yes….I almost always “dress up”. This dress has serious potential. I think I can wear this baby pretty much year round and make it look slightly different each time. I can totally dress it up with heels, jewels and a cute clutch like I did for my birthday back in April. Today I chose to go a little “safari” with it and add my straw fedora from Target and my oh-so-comfortable new sandals by REBECCA MINKOFF. (They are so versatile, go with anything and also come in black.) 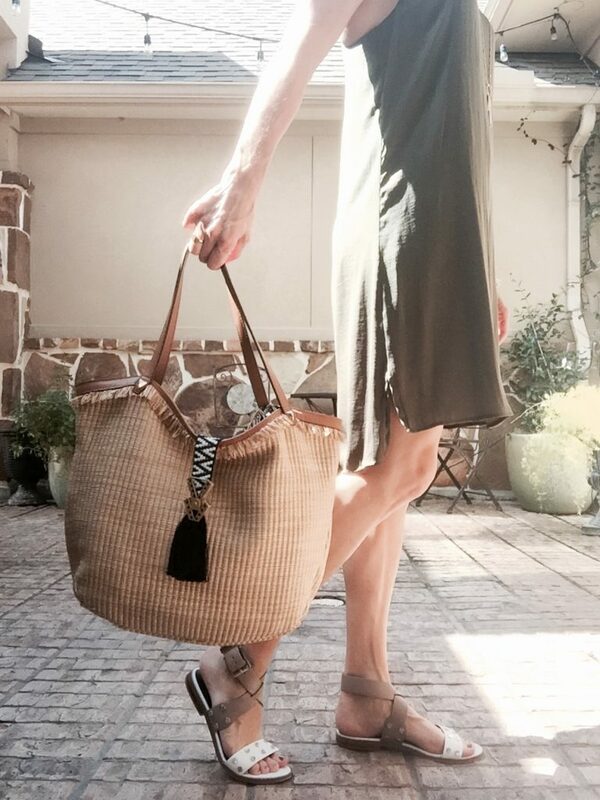 And I also echoed a daytime look with my accessories….the raffia tote is my go to summer purse. I mean, look at this thing! GORG! And totally on trend with the embroidery and black tassel. Add the long pendant necklace layered with delicate shorter ones and an arm party, and I’m ready to GO. (to HEB) But Kent just called and wants to take us all out for dinner tonight! So…maybe I’ll take along my new linen blazer from H&M, (see more of that in my post WEAR ANYWHERE SUMMER STYLE, or a cute scarf to cover my shoulders…it’s always chilly in restaurants. See! So versatile. These accessories are from the STELLA & DOT Fall Sneak Peak…the necklace is called the Quill, earrings to match, and then the spiked Renegade bracelet you ALWAYS see me wear, paired with the new Quinn cuff….it’s about 5 bangles all connected as one. Moves, has texture and give you the layered look with one piece. Brilliant! I don’t think this shot from above really does any favors for this outfit; but I’m including it because it shows off the Quill earrings much better than the pic above, and I think that’s worth sharing. Even though it’s a dangle, I’m telling you, you don’t even really know its there and I LOVE that. I’ve shyed away from big earrings for a long time, even though I’ve been a Stylist for over 6 years, because they are just too heavy. Well, if that’s the same for you, these are DIFFERENT! My hair…well…..I’m in between appointments. I’m stretching this one out a bit because I have a big event to attend in Orlando end of July, and I like my hair to be “fresh”, which means I will have it cut and colored about 2 weeks prior. So….for the next three weeks or so, I am sure I will be relying on all of my hats, and possibly add to my collection, to keep me looking acceptable to be in public! (Hmmm, there’s an idea for a new blog post…Summer Hats) haha…Oh come on, we all have those days! My roots are unacceptable; but when you color your hair, timing is everything. This picture, well it’s just a little sass for you. Kent and I have been busting our asses in our upstairs “weight room”. Committed to getting up at 5am every darn day (except weekends) to push, pull, and cardio our way to the best shape of our lives. Personally, I think it kind of shows here! I’ve never been this strong or fit in my life (and I have ALWAYS exercised), so it just goes to show…it’s never to late, you are never too young or too old to try something new, make yourself better in some way, start down a brand new path, or even just pivot on the one you are currently on. What is something YOU want to incorporate into your everyday? Everyone has a “5am”…what will you do with yours?? ?